Why Do Planes Keep Disappearing? With AirAsia 8501, a storm could have been the cause. With Malaysia Airlines 370, we still don’t know. Java Sea shows the coastline of islands during search and rescue operations by the Indonesian Air Force for missing AirAsia flight QZ8501 on Dec. 29, 2014. Are the events coincidental? Is there something about Southeast Asian passenger flights that makes them particularly vulnerable to Twilight Zone–style vanishing? Or have we entered a new era of air travel, in which anyone could disappear midair for no apparent reason? There are certainly a number of parallels between the flights. AirAsia Indonesia is a daughter company of AirAsia, which—like Malaysia Airlines—is headquartered near Kuala Lumpur. Both flights were scheduled to arrive in the morning. Neither issued a distress call or sent out an emergency locator beacon signal. And then there’s the question of proximity, both temporal (the incidents took place less than 10 months apart) and spatial (QZ8501 was last seen on radar less than 50 miles from the final MH370 “ping ring”). The incidents also share similar opening chapters. In the case of MH370, air traffic controllers took longer than they should have—17 minutes—to start asking questions after the plane failed to appear in their control zone. The initial area searched was the South China Sea, near the flight’s observed position on secondary radar. In the case of QZ8501, Indonesian controllers took half an hour to alert their Singaporean counterparts that the flight was missing. The initial search area is at the western end of the Java Sea, near the flight’s observed position on secondary radar. What remains to be seen is whether the stories will now diverge. 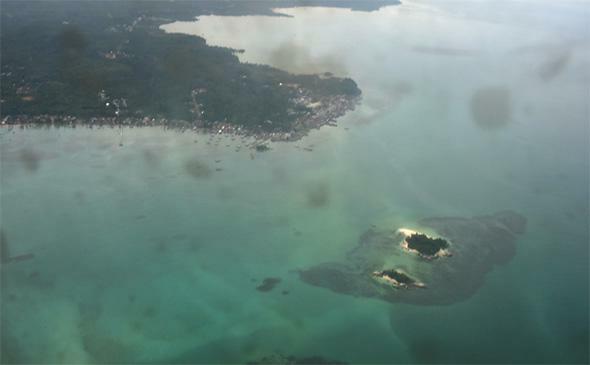 After searchers spent days looking in vain for surface debris, the Malaysian military revealed that its primary radar had spotted the plane pulling a 180 and flying west back over the Malay Peninsula. To this day, no one can really explain why that happened, or pinpoint where the plane subsequently went, as no debris or wreckage of any kind has turned up. So far, nothing so strange has transpired in the AirAsia case. True, after two days of searching, no trace of QZ8501 has been found, despite the fact that 30 surface vessels and 15 planes from Indonesia, Singapore, Malaysia, and Australia are combing the area. But only one of those days enjoyed favorable weather conditions. And the search area encompasses 50,000 square miles, the size of the state of Mississippi. Still, we shouldn’t have to wait too much longer before wreckage starts to turn up. Searchers took five days to locate floating debris from Air France 447 when it went missing en route from Rio to Paris in 2009, and that was out in the middle of the vast Atlantic. The factor that makes QZ8501 look most different from MH370 is the weather. MH370 vanished under calm conditions; there was never any reason to suspect that weather played a role. The AirAsia flight, in contrast, disappeared in close proximity to a tropical thunderstorm; shortly before it vanished the pilot reportedly asked air traffic control for permission to change altitude and direction. According to the New York Times, that request was denied due to the fact that other traffic was nearby. It’s quite understandable that a pilot would want to avoid a thunderstorm, especially a tropical one, which can pack energies on the scale of thermonuclear weapons—think huge chunks of hail, severe turbulence, 100 mph downdrafts, and rain so intense that it can douse the fire in an airliner’s engines. AF447 came down after it passed through the turbulent top of a tropical thunderstorm and its pitot tubes froze up, leaving the pilot flying confused about his airspeed. As a general rule, pilots are advised to stay at least 20 nautical miles away from a thunderstorm. If the pilot of QZ5801 saw a massive thunderhead dead ahead, and was concerned enough to request a change in his flight path, then maybe he should have gone ahead and diverted, even without permission. Ultimately, a captain is the person responsible for the fate of an airplane, and it is understood by everyone that if following air traffic control’s instructions puts the aircraft in danger, then it’s his duty to respond with “unable” and do whatever’s necessary to get himself and his passengers to safety. Then again, that’s always easier to say from the ground. There’s still every reason to believe that QZ8501 was lost as a result of natural causes, unlike the truly unusual MH370 case, where the evidence points to hijacking as the most plausible explanation for its disappearance; how and why the plane ultimately wound up flying off into the southern Indian Ocean, as most experts believe it did, remains utterly unclear. That impression will be reinforced as soon as the AirAsia flight’s surface debris is spotted; once that happens, searchers will begin trawling with audio equipment to pick up the plane’s black box acoustic pingers. Pulled from the sea, the black boxes will show exactly what the plane was doing and what the pilots were saying up to the bitter end. If this investigation goes the way most do, the mystery will be resolved in short order. On the other hand, in the rather unlikely event that no debris ever turns up from QZ8501, then we’ll be left with an even greater enigma than that of MH370. A short-haul workhorse, the AirAsia Airbus A320 lacked a satellite communications system of the kind that provided the “ping rings” that gave us the sole clues to MH370’s mysterious fate. It also didn’t have the Aircraft Communications Addressing and Reporting System that provided clues to AF447’s final location. (While some A320s have these systems, they’re optional.) In the absence of physical evidence, we’ll have nothing to go on at all. And yes, that will be very creepy.